English is a compulsory course in Chinese schools. However, like in many nations in the world, the English teaching in China mainly focuses on grammar and exams, which makes the subject very boring. Students have little to no interest in English and always find it a hard subject due to the wrong teaching method. Luckily, even if the school is not reliable and the education system is poor, there are still ways to learn English. Among all the interesting methods, watching TV series is one of the most powerful methods. The benefit of using TV shows to study a language is that it’s fun, and it caters to the psychological needs of the youth. Ever wondered how Japanese became a popular language among youth globally? This is due to the attraction of anime. Korean is also a language liked by many girls in western nations. That is thanks to Korean dramas. And here comes the conclusion: it is the same way that English TV shows can make English learning fun to the Chinese youth. As a matter of fact, some Chinese students do gain their interest through English TV shows. Once they have some favored stars, they want to watch more of their works and understand them better. Thus, they have the desire to learn English well. 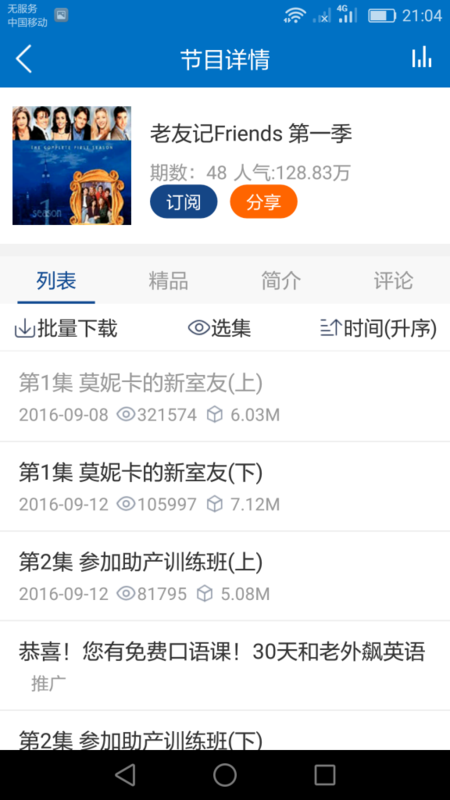 Out of all the English dramas that have been made so far, Friends is the most popular among the Chinese youth. In comparison with other TV shows like The Big Bang Theory, Prison Break the vocabulary in Friends is simpler and the speaking speed is slightly slower. This sitcom even has a copycat Chinese version called iPartment. You can see how popular it is across the nation. Friends can be a beginner TV series in learning English for Chinese students. 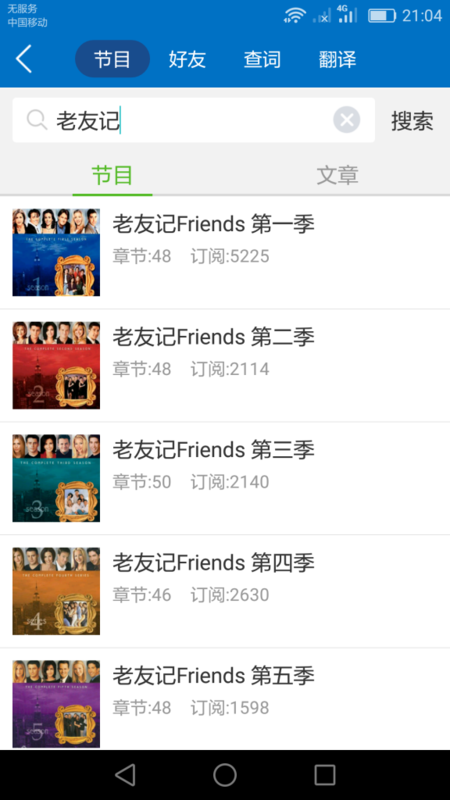 Yet, due to copyrights issues, Friends is not available in on Chinese websites and it is hard to download them as. This is because few Chinese sites provide the downloading link. Luckily, with the powerful app Keke English, you can still find the audio of this show. This app provides the full episodes of all ten seasons. Just type “老友记”in the search bar and you’ll find all of them. Each episode is cut into two footages, and every footage is 12 or 13 mins long. When you enter the study interface to listen to the audio, you’ll find bilingual subtitles. Every sentence has the function of loop playback, you can be repeated as many times as you want after the audio. 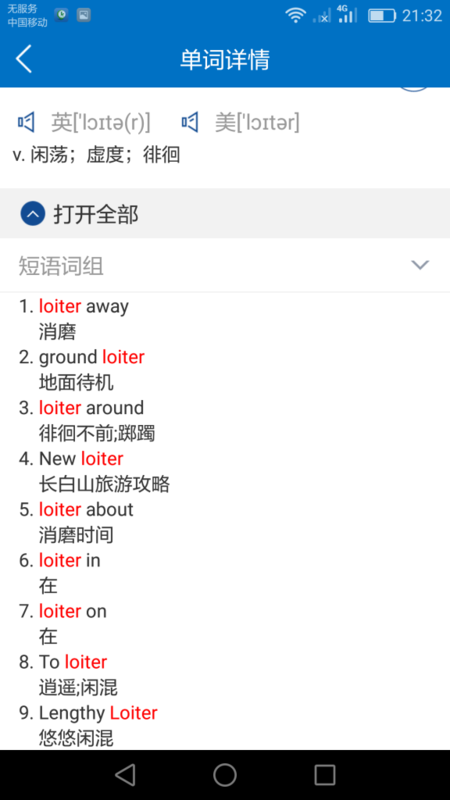 And if you encounter a new word, you just touch it once and the Chinese meaning will show up immediately at the bottom along with the audio given. Press the loudspeaker, then you’ll hear the pronunciation said by native speakers. 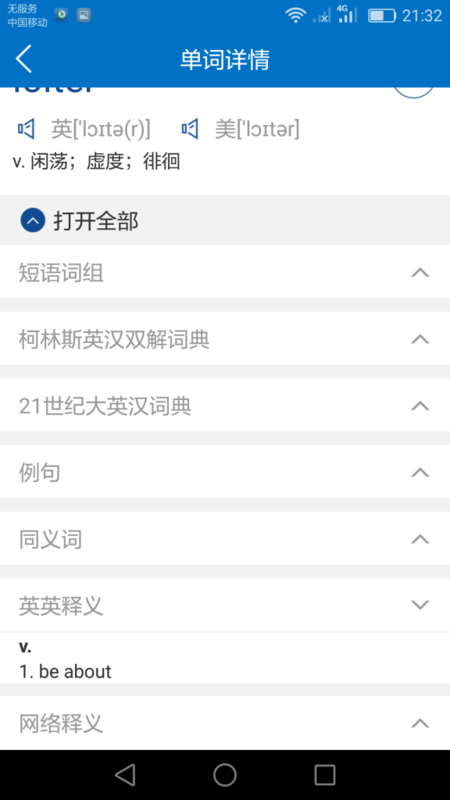 Click “添加生词” and you can add the word to your wordlist. Later you can find more details of the word in your wordlist. KeKe provides both British and American pronunciation, along with explanations in Chinese and English. You can also find model sentences together with some relevant phrases. Besides, this app also gives you a word test through listening and dictation. Just move your fingers on the smartphone and you can enjoy learning English within mins. And in order to enhance your English listening and speaking skills, it’s suggested to listen to each audio 4 or 5 times. After listening to the audio for the 1st time, check the script for the new words and phrases you don’t know. 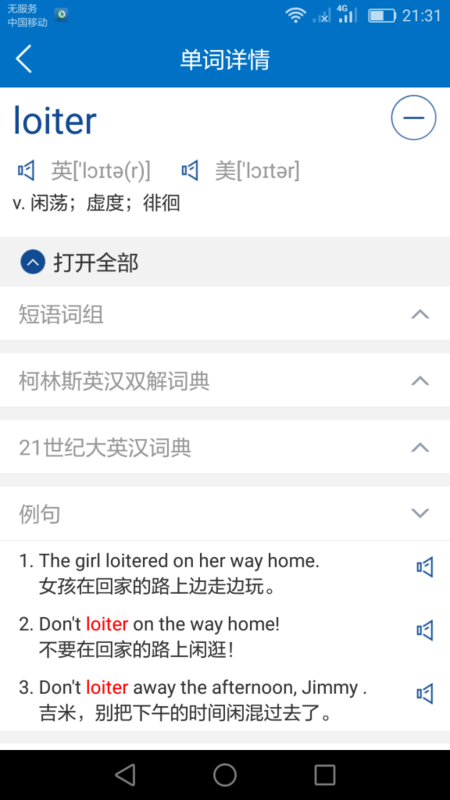 You can firstly practise them in the Keke English vocabulary test, and then take them down in your notebook. These are the parts where you can improve your English. You may learn ten new words or phrases in one episode, and the more you listen or watch, the more you’ll become adapted to native speakers’ speaking speed and intonation. For any students who want to enjoy the real TV series, they can also choose to buy it online. An important thing you need to remember is practising regularly. If you only spend very short time or quickly abandon it, you won’t make any progress in your English. It’s just like running, if you haven’t run for a while, your speed and stamina could drop sharply. It is the same with English. In each practice, the time should be at least an hour. For those who use the videos to learn, they can download bilingual subtitles. One should at least watch each episode 3 times. The 1st time close the subtitles whilst watching the episode, and at the 2nd time open the subtitles and check the parts you don’t understand, then take down the new words and phrases into your notebook, have a self-dictation after reviewing the episode. And at the 3rd time, once again you watch it without subtitles, then you’ll find you really make progress this time. If you still have unclear parts, you can choose to watch one or two more times. As a classic sitcom, Friends can always bring you a lot of laughter. So, why not learn English with something can make you happy? It will give you motivation for continuous learning. 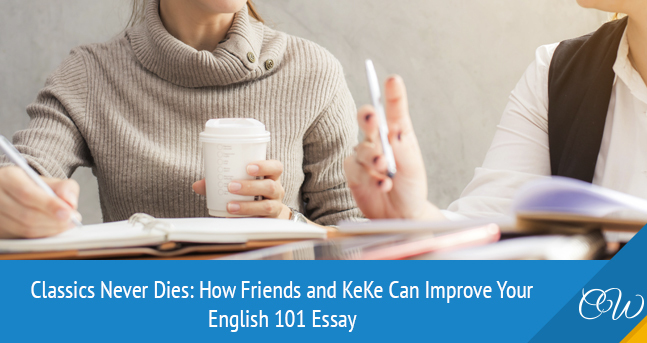 Through such happy English learning method, you’re surely to do well in the English 101 essay.